All defragmenters work with a file system that has been optimized by the Windows Defragmenter. The system is a fresh install and only a few days old, i.e. there is little information about the long-term use. Thus, for example many files have a current "Created" and "Last modified" timestamp. The time stamp "Last accessed" is not updated any more by default since Windows Vista. The defragmenters have not been tested over a longer time period, i.e. they have only one chance to optimize the file system. How efficiently they can maintain it will not be tested. The image of the system volume is restored and the system time is set to 01/01/2013, 16:00 o'clock in the BIOS. This ensures that for example TV-Browser always loads the same data. All times (except for the creation of user files) are measured with a stopwatch. All tests are performed at least three times. If there is an outlier in the values, the test is performed once more. This is a list of all (so far) tested defragmenters. The links lead to entries in the forum, which describe the particular defragmenter in detail. The defragmenters and their performance can also be discussed there. The classic test to test the efficiency of a defragmenter. But when has Windows finished booting? When the desktop is visible? When all background programs are loaded? In this test, a realistic definition is used: The booting process is finished after Firefox has displayed a locally stored copy of the "The Big XP Defragmenter Test", i.e. the computer is effectively usable. Firefox is started by clicking on a shortcut on the desktop as soon as it is visible. From the first time the hard drive is accessed until the welcome screen is visible. From the welcome screen until the desktop is visible and Firefox can be started. From the start of Firefox until the loading the test page is completed. Additionally, Windows itself measures its boot times and writes them to the event log. MainPathBootTime is the time from the appearance of the Windows logo to the desktop. BootPostTime is the time from the appearance of the desktop until Windows is ready to use. The list is sorted like the above list so that the resuls can be better comapred. 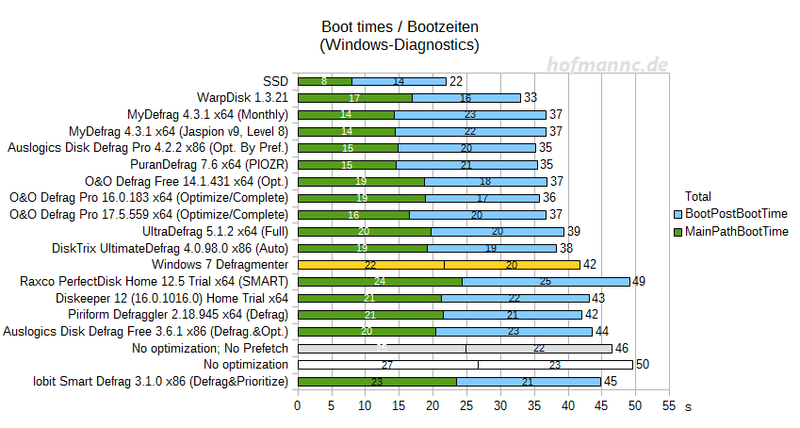 Apart from a few defragmenters, several could improve the boot time more or less greatly. Amazingly, the Windows 7 Defragmenter is not as good as its Windows XP pendant. 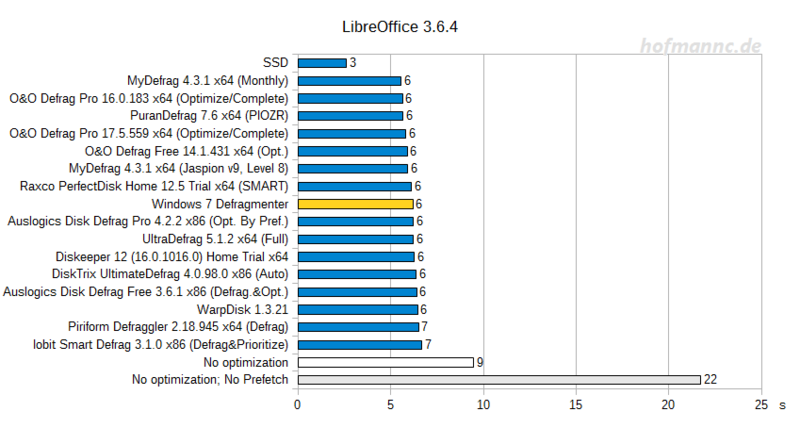 Depending on the method of measurement you look at, it is either MyDefrag 4 or O&O Defrag Pro 16 (Update 1.2: as well as WarpDisk) that is at the first place. This also shows an outlier of Raxco PerfectDisk 12.5 Home, probably because of the services running in the background. The impact of Prefetch has significantly changed. While the boot time could be accelerated significantly in XP, Windows 7 needs even a little more time in order to be operational. This behavior changes significantly, however, when looking at the following tests. Update 1.2: IObit Smart Defrag extended the boot time significantly. But if it is not started automatically with Windows, the boot time returns to normal. LibreOffice represents an office application and is started by opening a small test document. This is a disappointing figure. No defragmenter could perform significantly better (or worse) than the Windows 7 Defragmenter . This also shows clearly how strong the influence of Pre- and Superfetch is. Update 1.2: Only the SSD was able to reduce the start time. Gimp represents a graphics application that is started by opening a small image file. The results are similar to LibreOffice. 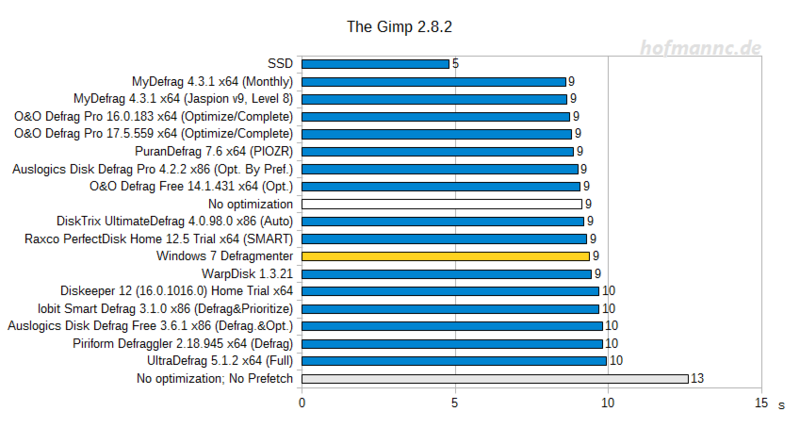 Gimp shows itself generally not as prone to fragmentation or optimization. Superfetch only could reduce the startup time by a few seconds. TV-Browser is an application to browse the channels of various TV and radio stations. The downloaded data is stored in lots of very small files. If these files are scattered all over the drive, the start time significantly increases as the read heads of the HDD have to move a lot to read all the files. This takes even longer if these files are also fragmented. Furthermore, not all of the accessed files are indexed by Prefetch. The defragmenter must be able to improve the start time without the Prefetch information. Here must also be mentioned that the measurement will stop until the appearance of the program interface is visible. In the background, other informations are still being loaded. However, up to this point the program is already usable. 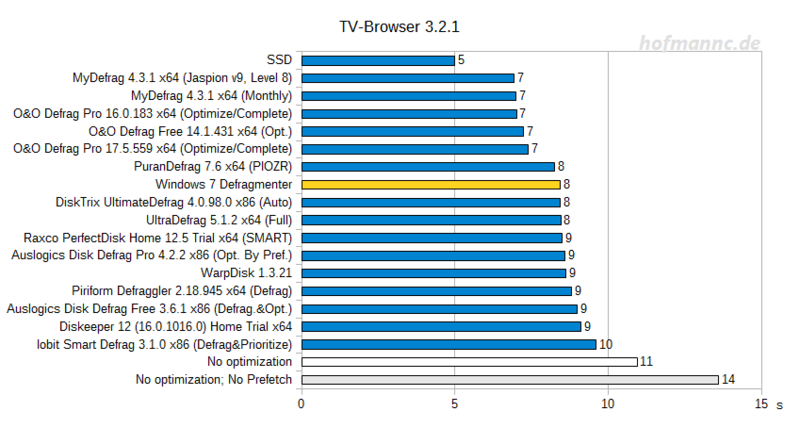 Again, the list is headed by MyDefrag 4 and O&O Defrag Pro/Free which could improve the start time by a good second (14% improvement). Eclipse is a development environment that is written in Java and that is used for programming of (mainly) Java applications. Here too, the results do not really differentiate from those of the other tests. Civilization IV represents a turn-based strategy game. The game is started by the direct loading of a saved game. This is a very large map, which was populated in full. The graphics settings are set to minimum, only the terrain details are set to "high". This time the results are more distinguishable. The list is (again) led by MyDefrag 4 and O&O Defrag Pro/Free which improved the loading time of the game by nearly 10 seconds, compared to the Windows 7 Defragmenter. Gothic is an open-world fantasy RPG, and represents the real-time games that are played from the first- or third-person perspective. In this genre, mainly the FPS (frames per second) are important, which should ensure a smooth gaming experience, if they are high enough. For this test, the landscape is crossed in flight mode for 30 seconds, so new data must be loaded constantly from the disk. All graphics-related settings (resolution, quality, AA) were set to minimum so that the graphics card is not the limiting factor. The visibility and texture quality is set to maximum, to load as many objects as possible. Unlike Civilization, Gothic consists of only a very few, but very large files. Thus, the starting time is expected to be relatively constant. Also the average FPS did not vary much. From these two tests, it is clear how different game performance is related to fragmentation and optimization and one can therefore not really generalize. For example, a quick test with Crysis showed that defragmenting only shortened the loading times, the FPS, however, remained the same. 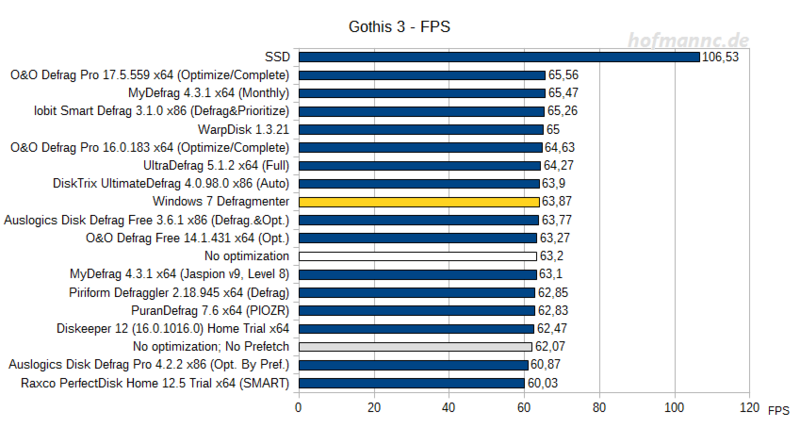 Other games could be more "optimization-happy" in terms of FPS, but this strongly depends on the fragmentation of the game data files after installation. Update 1.2: The SSD shows a significantly better performance here, but this is to be blamed on the unrealistic test situation, which forces the game to continuously load new data. 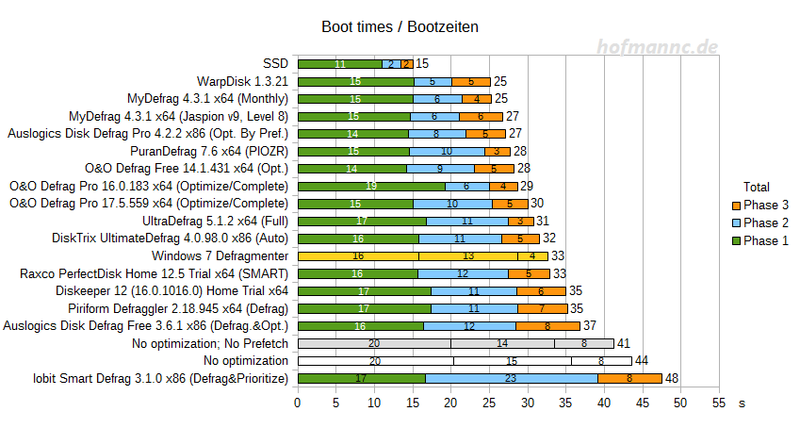 After the individual tests, the boot and start times of all tests (except boot times measured by Windows itself) are being analyzed and a performance factor is calculated. The Windows 7 Defragmenter is taken as basis with 100%. Additionally, the amount of data that has been written to the disk is specified in order to create a connection between optimization and data movement. Since the time required for the defragmenter to optimize the volume is mainly proportional to the amount of data that is moved, it is omitted from the graphic for clarity. Note: Since Process Explorer could not capture the data movements of the Windows 7 Defragmenter, there are no values specified. The results turn out pretty disappointing. 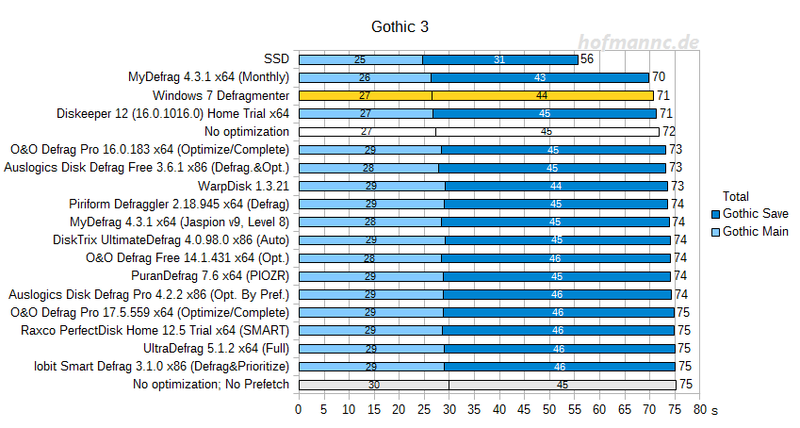 Only MyDefrag 4 improved the performance by 13%, which is in the range of where an improvement is even noticeable. O&O Defrag Pro 16 just managed to get to 8%. But the results should be considered relative: Only the boot time and the start time of Civilization could be noticeably improved, there was no noticeable improvement for other applications, though. DiskTrix UltimateDefrag 4 stood out rather negative: The manufacturer advertises a performance improvement of 400-600% (even for Windows 7), but the defragmenter managed to improve the performance by only just 1%. Diskeeper 12 also stood out slightly negative as it increased the boot time by 2 seconds. This is probably the price you have to pay for the extra features, since the Windows 7 Defragmenter is nothing more than a stripped down version of Diskeeper. 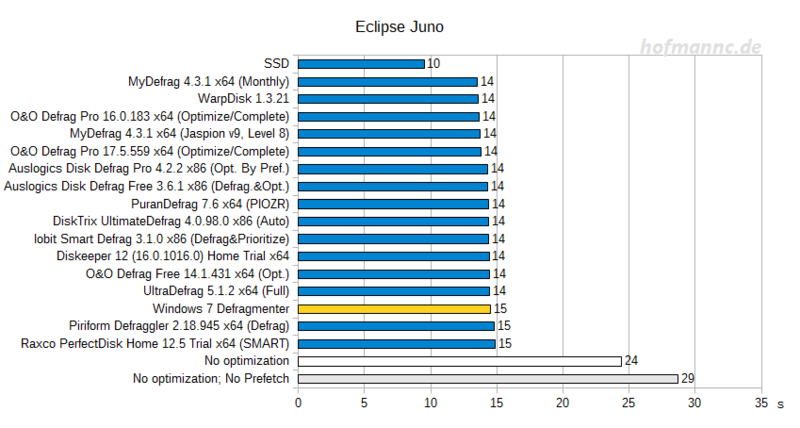 Update 1.1:But even with few features Auslogics Disk Defrag 3.6.1 Free managed to influence the performance rather negative. Update 1.2: The negative list is now joined by Priform Defraggler 2.18.945 and IObit Smart Defrag 3.1.0. The latter in particular extended the boot time significantly. 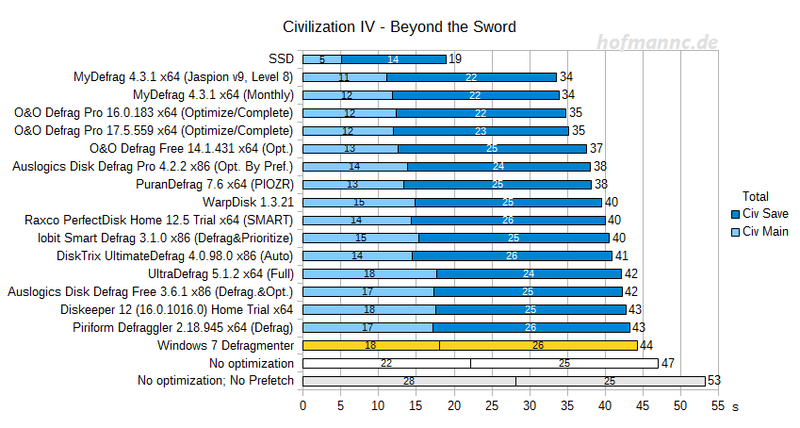 The SSD is constantly on the 1st place, indicating that a piece of hardware can bring more performance than software ever could. In terms of data movement or processing time one can see as a trend: The better the performance, the more data needs to be moved, and the longer the optimization takes. 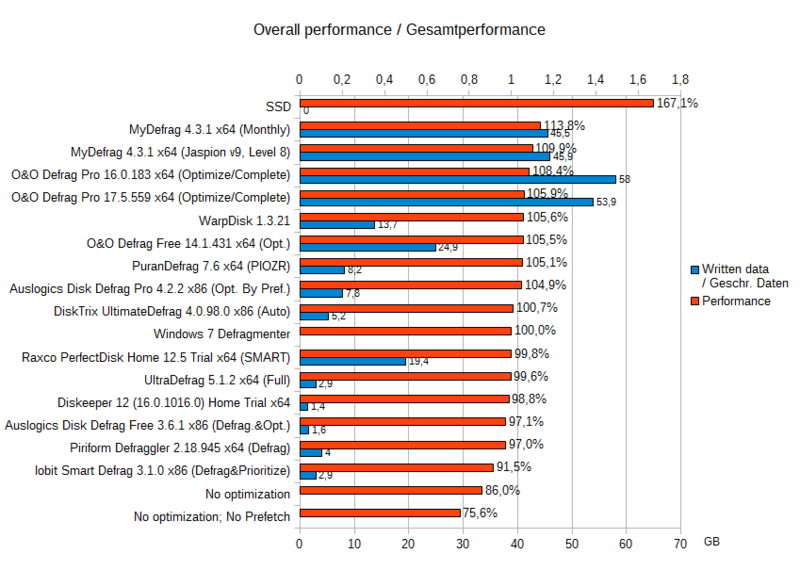 However, MyDefrag 4 moved less data and achieved a better performance ​​than O&O Defrag Pro 16.